Thanks for your software! It was perfect. I had to run on XP inside a virtual box, but everything installed as expected. I found the error code, but this body owes me nothing. Has anyone replaced a shutter in one of these? 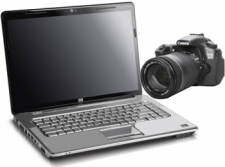 I'm curious if it's like the D7000 where you have to reprogram when you replace it. Ranked daily by the Better Business Bureau. ‘Click’ on the BBB logo for their report! Read through Testimonials and Reviews from Real Customers / Real People. 10% Discount for 2 or more! USA orders are shipped by Priority Mail with a tracking number. International Airmail requires a Customs Form which provides tracking number to point of departure of USA. International Priority Mail is faster but more expensive. It has a tracking number but tracking to point of departure of USA. For some destinations this tracking number can be used to the delivery point. 10% Discount for 2 or more softwares on the same Invoice! 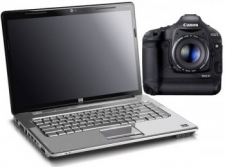 Canon EOS 1Ds MK III Software Requires Windows XP or XP-Pro. Emulators are not supported. 1st time buyer? Want a look before you purchase? You can get 'FREE' Demo Software or contact us at cc5@earthlink.net . 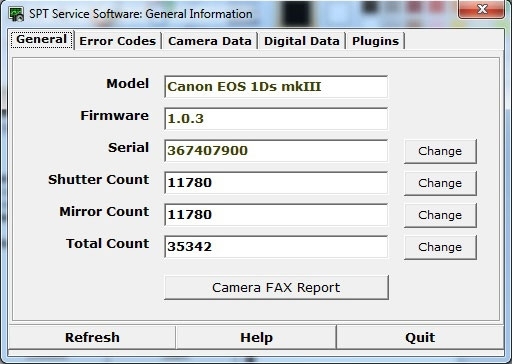 Print and pdf the Improved Camera FAX. 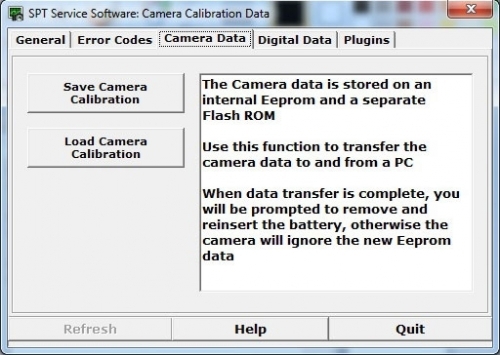 Read and change the camera's electronic serial number. 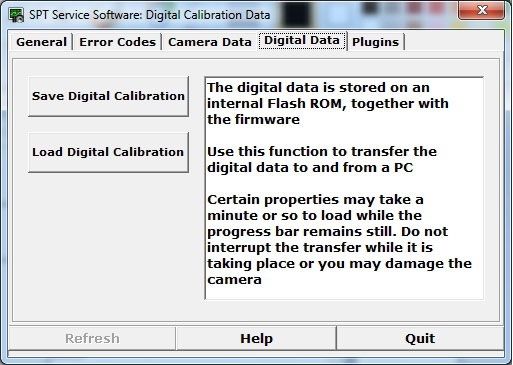 Read and change the camera's Shutter count. 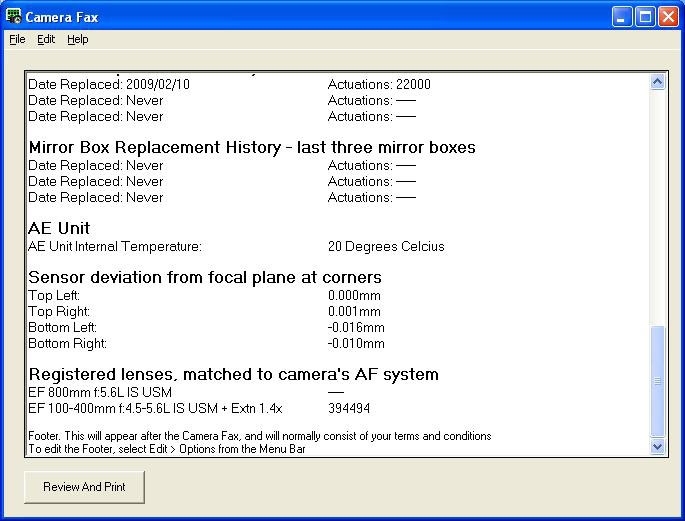 Read and change the camera's Mirror count. Read and change the camera's Total count. Identify the Lens on the camera when the error occurred! 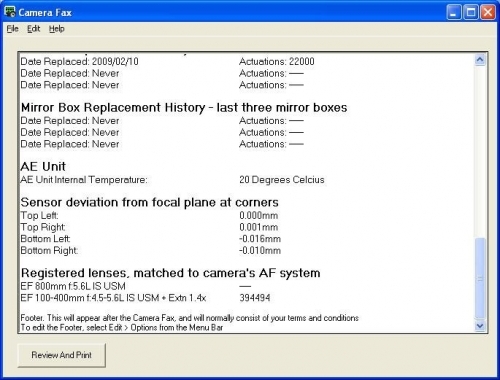 Download, save and upload the camera's Adjustment data. 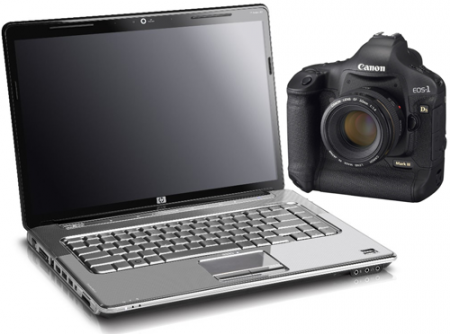 Download, save and upload the camera's Digital image data. 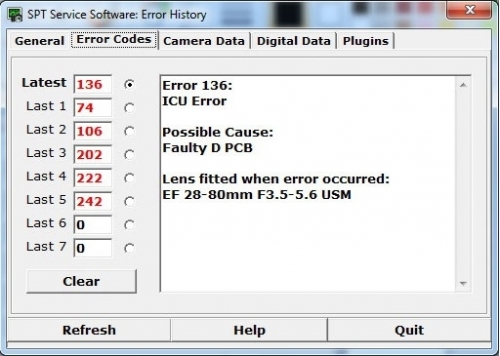 Essential allows MAIN PCB REPLACEMENT WITH A SALVAGE PCB by swapping the data files. Just click 'Help' in any function and your Help window automatically opens to that section .. perfect! We have used many Help files in other softwares only to become frustrated trying to find the right section and then trying to understand the what it means. We give clear directions with help sections linked to their functions. You are also able to access all areas of the help files in any function. Evolving Error Codes and Free Updates! All are part of your software package! 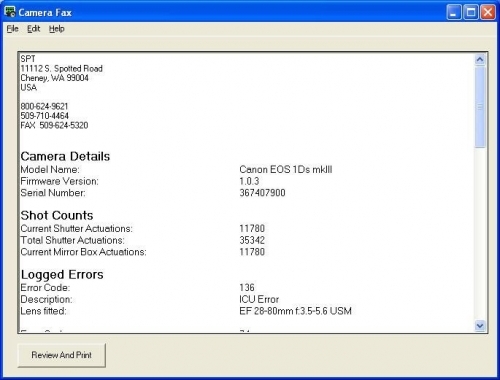 SPT software starts with all known internal error codes and their possible cause(s). But as the camera repair field links internal error codes to additional causes we add that information to software updates. 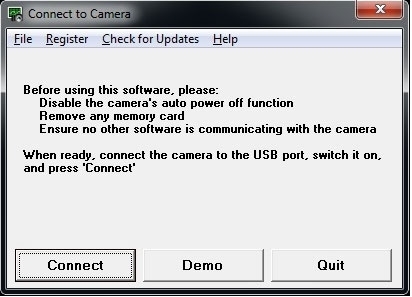 Free updates also allows your software to adapt to changes in both hardware and firmware. Lots of horsepower under the hood. Our user interface remains simple and intuitive but there is allot of extra new code under the hood keeping it that way. Among other things, all this extra code insures that you won't need an incredibly expensive interface tools when doing adjustments. 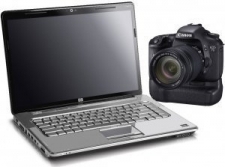 10% discount for orders of 2 or more Softwares on the same invoice! 10% Discount for orders of 2 or more $89.10 / ea You Save: $9.90 (10%)! © 2019 - SPT / C&C. All rights reserved.